In running a successful business, you typically need the services of three professionals — a good tax accountant or CPA, insurance agent and an attorney. Know that talent and skill levels are crucial for your success. As I wrote in the Checklist – 10 Legal Basics for New Entrepreneurs, research lawyers thoroughly before making your selection. As for hiring the right attorney, anticipate your possible reasons for hiring one. That includes matters from legally binding agreements to protecting yourself from customer or employee allegations and behavior. 1. Check to see if the attorney has a significant business-law practice. Make certain your attorney practices business law. Business law must include all or at least most of the attorney’s practice. Unlike some professionals who might have skills which are applicable in numerous industries, when considering a lawyer, don’t settle for a generalist. Hire a business attorney. 2. Research the attorney’s experience. In business law, experience counts. You’ll want an attorney who has experienced your likely scenarios on numerous occasions. 3. Past performance is an indicator of the future. In interviewing an attorney, ask about their pattern of results — their performance record. 4. Personality is important because the two of you will need to be on the same page. When you meet for an interview, discuss more than just your legal concerns to determine if you two mesh well. 5. Evaluate the person’s communication style. Is it compatible with yours? Whether it’s via e-mail or phone. 6. Continue your research. Check out at least four things — the attorney’s Avvo rating; whether the person is even listed at SuperLawyers; the lawyer’s record for possible disciplinary action with the state bar association; and even check to see if the person has been covered in the news media. An attorney I spotted in the media for winning cases turned out to be one of the best I’ve hired. 7. Get references from people you know — preferably in your industry. Attorneys can be persuasive even if they’re not skilled in the courtroom. Exercise due diligence. Even if your research turns out favorably in tip No. 6, it isn’t always conclusive. You can usually get more specific, salient information about an attorney in a confidential chat with your associates. 8. Review the attorney’s aptitude and judgment. Make sure you and the attorney have the same level of risk aversion. Some legal matters are only mole hills. Other matters are mountainous. You need someone who knows the difference. You might also need an insightful attorney for a complex legal matter, so don’t hire an attorney who can’t analyze issues. Don’t assume anything. Not to be gauche, but like any profession, some lawyers can’t see beyond the end of their noses. On the other hand, I’ve encountered some excellent attorneys. 9. If you have no other choice and you anticipate going to trial in a serious legal matter, check out the attorney’s level of confidence and ability in such situations. It gets expensive when a bunch of lawyers start gathering. But go to court if you must. Know that some lawyers are terrified of going to trial and to present arguments in front of a judge or jury. You’ll need analytical, tough and successful representation. 10. Research the attorney’s fee structure. Legal fees can vary considerably. Know in advance what you’ll be paying. Make certain there’ll be no surprises. So do your due diligence. Ask lots of questions. Good luck. 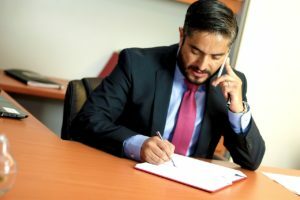 HR Tips to Avoid Legal Hassles with Immigration and Customs Enforcement — This includes strategies on how to respond to an ICE audit. Employers have been having problems with the U.S. Department of Homeland Security’s Immigration and Customs Enforcement (ICE). 6 Patent Tips to Protect Your Inventions, Intellectual Property — Whether you’re a new or existing business, take precautions to protect your inventions. Entrepreneurs are well-advised to consider ways to avoid legal entanglements over their inventions and intellectual property.